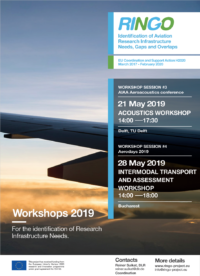 We are glad to announce that a set of three workshops will be organized soon in the framework of the RINGO project to collect information about needs of aviation research infrastructures to fulfill the goals of Flightpath2050 that specifically concern the research fields of “Production and Mechanics”, “Aerodynamics” and “Aeroelastics”. The workshops will be held in Glasgow, during the 8th EASN-CEAS International Workshop on “Manufacturing for Growth & Innovation”, on the 5th and 6th of September. Each of them will last approximately 2,5 hours and will involve a limited group of participants. The admittance to the workshops is free. If you are expert in one of the research fields addressed and are interested in attending the workshops please participate first of all in the RINGO Survey, whose output will be used as basis for the discussion, and indicate directly in the questionnaire your availability and interest in joining the face to face meeting. If you have already completed the survey without giving your availability for the workshops and want to candidate to attend please feel free to contact the workshop coordinators directly at j.p.reitsma@tudelft.nl and/or sarina.brautmeier@ilr.rwth-aachen.de.